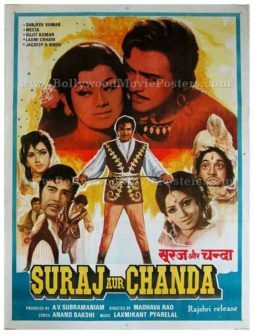 Artistic, old hand painted Bollywood poster of the Hindi film Suraj Aur Chanda (1973) for sale. This is an actual surviving poster of the 1973 old Hindi film that starred Bindu, Laxmi Chhaya, Jagdeep, Sanjeev Kumar & Sujit Kumar. Printed several years after the first release of the film (somewhere in the 1980s), this artistic hand painted Bollywood poster was originally designed for publicity of the re-release of the film but never ended up being used. This old Bollywood movie poster was originally designed on a hand painted canvas, making it very collectable. It features seven figures hand painted with accurate detail at the bottom. The top half of the poster features a large photographic still which has been over-painted to give it a hand painted look. Suraj Aur Chanda (Sun and Moon) is a 1973 Hindi film that starred Bindu, Laxmi Chhaya, Jagdeep, Sanjeev Kumar & Sujit Kumar in lead roles.